Well, that's about all from an afternoon which has seen Crusaders, Warrenpoint Town and Ballinamallard United book their places in the semi-finals of the Irish Cup. 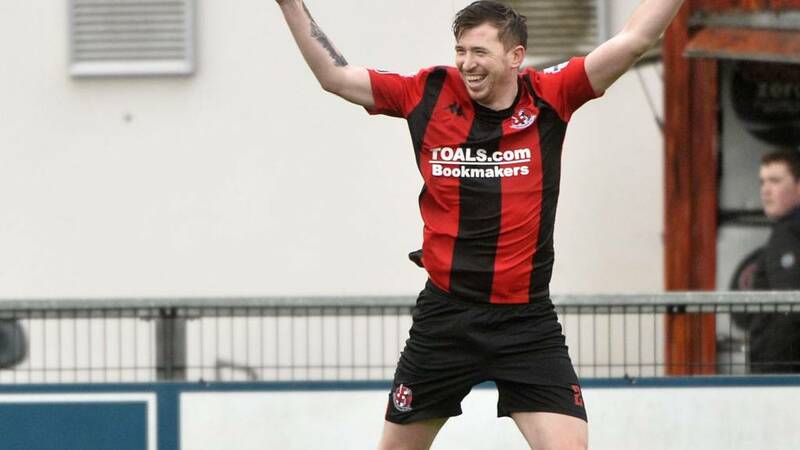 Crusaders ran out ultimately comfortable 3-0 winners over Ballymena United, Warrenpoint saw off Larne Tech Old Boys 3-1 courtesy of a Simon Kelly hat-trick and Championship club Ballinamallard United defeated Dungannon Swifts on penalties after their tie ended 2-2 after extra-time. Meanwhile in the league Cliftonville earned a 2-0 victory over Glenavon at Mourneview Park. Keep an eye on the BBC Sport NI website for highlights of all today's games appearing shortly and join us again next Friday night for live BBC Two television and online coverage of Glenavon's Premiership match with Linfield. Ties to be played at neutral venues on Saturday 30 March. David Armstrong's penalty for Dungannon crashes off the bar and Ballinamallard United are in the semi-finals of the Irish Cup for the first time! The shootout finishes 3-2 to the Championship side. Seanan Clucas keeps Swifts in it - it's 3-2 to Ballinamallard. Josh McIlwaine keeps his cool to put Ballinamallard 3-1 ahead in the shootout. Alex Moore keeps Dungannon in the game as he keeps out Ryan O'Reilly's penalty. Daniel Hughes finally opens Dungannon's account but it's still very much advantage Ballinamallard. Jarlath O'Rourke fires over and Dungannon are in all sorts of trouble! Ballinamallard lead 2-0 after Richard Clarke and Chris Kelly convert. Paul McElroy's opening penalty for Dungannon is saved by John Connolly. Video caption: Campbell gives the Mallards a lifeline!Campbell gives the Mallards a lifeline! It's overall at Stangmore - penalties it is. Stay with us to see who will complete the semi-final line-up. Really disappointed. I thought we played alright up until the final third and then our crossing and hold-up play let us down. That's where they hit us with their breaks and it worked for them today. From our perspective, we lacked quality in final third and it's becoming a habit at home. I can't remember the last time we played well for 80, 90 minutes at home. The general play until the last third was good but we're lacking belief and confidence. We need to start looking at that. You're not expecting that sort of performance but for some reason our quality or delivery wasn't good enough - and I'm not blaming any individual, it was everyone. I think we should have had two penalties for handball and Rhys Marshall had a good shout for one too but it obviously didn't go our way. We changed our shape at half-time and went with a more direct approach after the break which worked for us. We gave it our all and made them work hard for it and, while it wasn't to be for us today, it's still been fantastic for the club to get to this stage of the competition. We want to use this now as motivation as we aim to win promotion in the league. Ryan Campbell heads Ballinamallard level again! Swifts keeper Alex Moore initially does well to deal with a through ball but he then chases the ball outside the penalty area and when the cross comes in for the right, it's perfect for Mallards top scorer Campbell to head home through a ruck of Dungannon defenders. Penalties very much back on the cards now! Quote Message: We have no complaints. Overall on the day Crusaders were the better side and deserved to win. They were sharper and quicker to the ball whereas we looked a little bit tired and leggy, not as sharp as we usually are. We have no complaints. Overall on the day Crusaders were the better side and deserved to win. They were sharper and quicker to the ball whereas we looked a little bit tired and leggy, not as sharp as we usually are. Alan Teggart puts Dungannon ahead but it owes so much to the persistence of Paul McElroy, who runs at the Mallards defence before cleverly playing in substitute Teggart, who slots past John Connolly. We had plenty of opportunities in the game and made it difficult for ourselves when we didn't take them. Fair play to Larne Tech because they came out and had a right good go after they scored. They had more fans than us today so that shows how big an achievement it is for a club of our size to reach the semi-finals, which is a date we will look forward to.